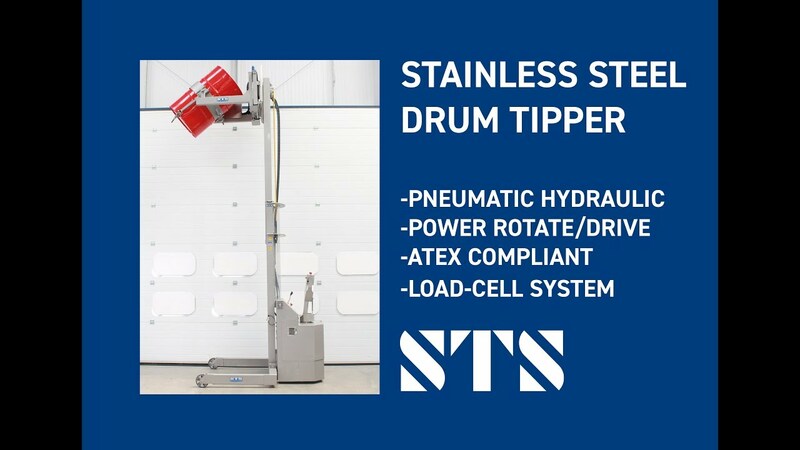 A large multinational company approached us to design and manufacture a piece of ATEX equipment for their drum handling process. We have many years experience in supplying industry-leading ATEX drum handling equipment. Our ATEX equipment can be either manual-hydraulic or pneumatic-hydraulic powered. For all bespoke work we provide 3D CAD approval drawings for your review before manufacture. 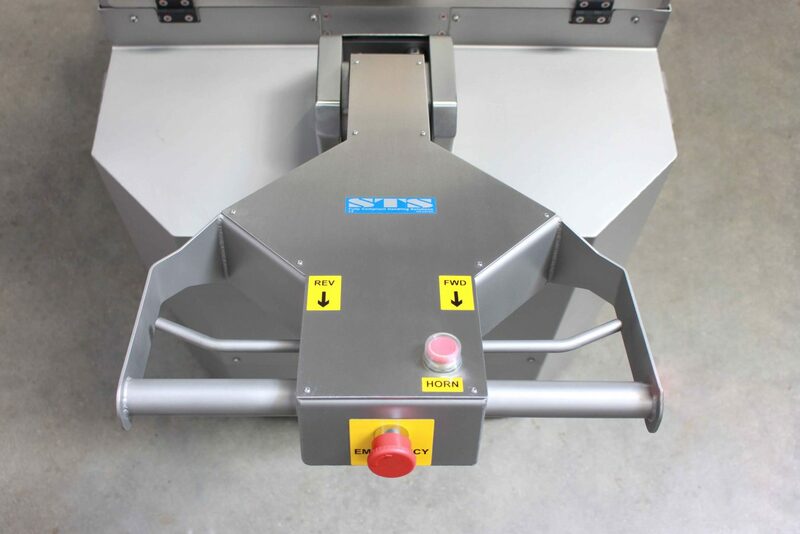 See the below case study showing a recent piece of equipment we designed and manufactured. Drums needed to be lifted and tipped into a process vessel which was 3070mm high. A safe working load (SWL) of 350kg was required based on the heaviest drums being handled. Unit was to be used in a good manufacturing practice (GMP) area and therefore a stainless steel 304-grade construction was requested. 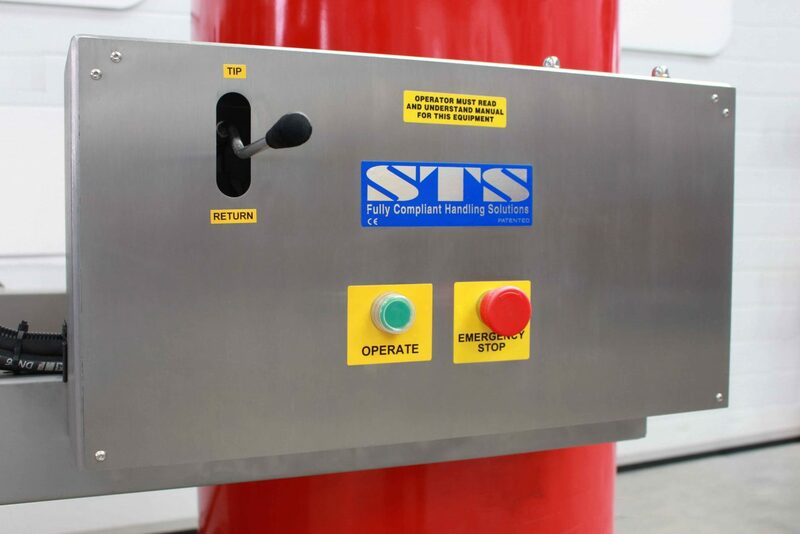 Area contained flammable/explosive materials and as such the handling equipment needed to be ATEX compliant. Due to the required speed of planned operations, a power drive system was requested. 3500mm of lift height was provided for the tall decanting height. Constructed from stainless steel with an aqua blasted smooth clean finish. For use in an ATEX environment we supplied this model with a pneumatic-hydraulic power pack. The hydraulic system powered the drive wheel with controls being mounted in the tiller assembly. Pneumatic drive systems are complex to manufacture but are a more cost effective solution than an electric system when ATEX is a requirement. In order to power the various functions an airline connection is required. The tiller controls featured two levers for forwards and reverse; the unit also had a horn to warn personnel in the vicinity. Pneumatic-hydraulic tiller controlled drive system. 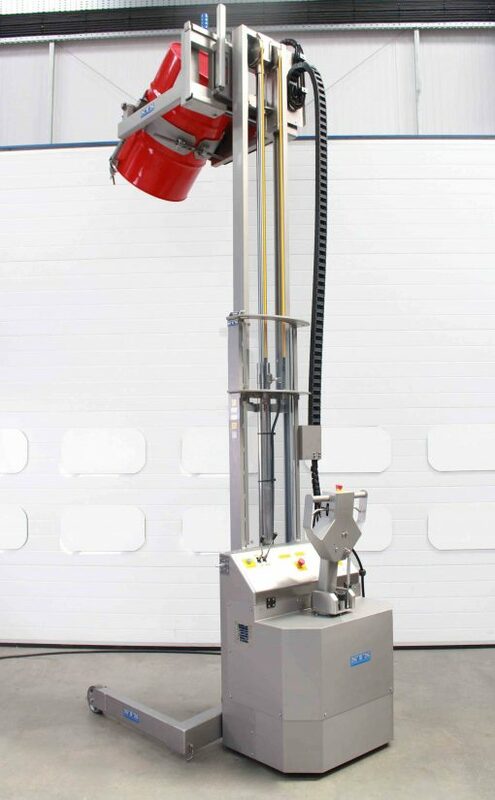 For this machine, drums needed to be tipped at height near the opening of a large vessel. By adding head rotation controls operators could tip drums while monitoring the quantity entering the vessel. 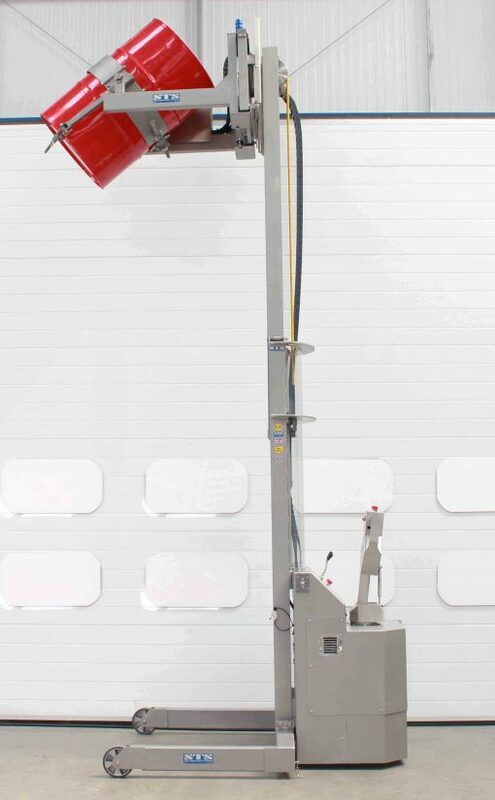 We can tailor the position of rotational controls on all our drum lift and tip models. The operate button shown in the picture was added as a safety feature, this ensured that the rotation function was not operated by mistake at any time. This model included head-mounted tip and return controls. A full operation and training video was supplied with the equipment to show correct usage. A video is also a great way to refresh operators with how best to use the equipment in the future. If your company requires a piece of bespoke ATEX equipment please get in touch with our team. We will happily discuss your requirements and advise on the most suitable piece of equipment for your application. Alternatively take a look at our standard range of ATEX handling equipment and let us know what interests you.